Product prices and availability are accurate as of 2019-04-02 14:12:04 EDT and are subject to change. Any price and availability information displayed on http://www.amazon.com/ at the time of purchase will apply to the purchase of this product. 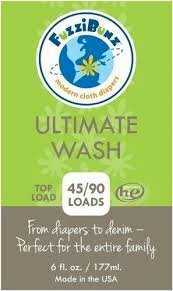 FuzziBunz EcoFriendly Ultimate Wash. Does 45 top loads or 90 he loads. Formulated to remove waste, residue, and bacteria known to cause odors and diaper rash. . Free of dyes, fragrances, enzymes, paragons, phosphates, nitrates, sulfates, BTA, caustic and other harsh chemicals. Cloth diaper safe. Avoid use on wool. Convenient squirt top included.